“All of the good that was done after 9/11 up to now has been reversed singlehandedly.” Thanks, Coyote-in-Chief! Retired agent: U.S. gov’t assisting downfall of U.S. Open border outside Rio sector conduit for dirty bombs, chem weapons, etc. City Council near Galveston TX approves resolution prohibiting city gov’t from assisting feds to house illegalistas. More details on $190M Baptist shelter contract. Building offices in 6 cities to expand nationwide. Feds opening $50M resort for illegalista minors. Tennis courts, sauna, and pools. Portrait of the flood: “We used to chase after them; now they are chasing us,” one official said. Dem defeats after Marielito boatlift could be repeated. State money (e.g., Medicaid) used for illegalista minors without knowledge of legislators or taxpayers? Find out in your state. Concern that gov’t shelter contractor Heartland Alliance staff may have criminal records. Liberato.US scoop: Baptist Child & Family Services gets new $190M gov’t contract for UAM residential services. Dwarfs previous awards. White House shifts, says illegalista minors who face credible threat of death will get asylum. DHS Secretary Johnson: “our borders are not open to illegal migration. … We will send you back." LIAR! Want a better life? Stay in your own country and make it better. U.S. gov’t “completing the smuggling cycle” for criminal enterprises bringing children here. Surge of illegalista minors began with Obama’s lawless Deferred Action for Childhood Arrivals (DACA) in 2012. Gov’t sources say “great uptick” of persons entering U.S. from foreign countries with terrorist links. Catholic bishops press for more alien minor funding. (Just another special interest group on the fed gravy train). George Soros has given more than $100 million to immigrant rights, amnesty, and open borders groups since 1997. They deliberately keep us in the dark about health risks and criminal backgrounds, but they work for US! 429 illegal alien criminals sent to Chicago, U.S. Senator’s request for criminal backgrounds refused. Michigan town of 3,000 to get 60-120 male migrants ages 12-17, background unknown. Money for them but not for vets. Are these illegal-alien operations hampering readiness and morale at Fort Sill? TB can take 6 years to incubate. Everyone on a bus or in a school classroom with a contagious border kid is exposed. Obama endgame an end to U.S. sovereignty and assimilation into a North American Union? Kids used to tug heartstrings? Obama request for border funding addresses symptoms. Failure to enforce the law is root cause. Are we in the USSR? Gov’t controlling freedom of the press re border facilities. We the People have a right to know conditions. HHS lying and covering up TB infections at Lackland AFB. Facility a ticking time bomb. Nurses reporting conditions under threat. 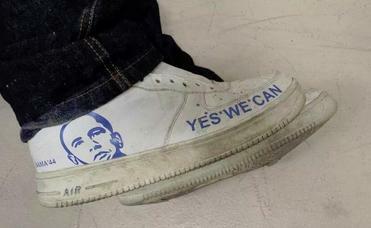 Source: Illegal photographed wearing Obama ‘Yes We Can’ shoes. Obama: ‘The kids can’t stay.’ Sure, and you can keep your plan. Another ‘Lie of the Year’ in the making. Mother of dead Guatemalan boy has regrets; coyote assured her the boy would be safe. Rep. Bridenstine on Levin: Crime and poverty always hi in Central America. Why flood now? Obama caused this. Rep. Bridenstine on Levin: what are they trying to hide? Horror stories? What don’t they want us to see? Feds won’t discuss what’s next for kids blocked from Murrieta CA. Secrecy increasing. Rep. Bridenstine was refused entrance to Oklahoma shelter; other politicians visited 2 wks ago. Secrecy increasing. Obama deliberately targeting conservative areas with immigration flood to change politics? Fed “Brown Shirts” threaten arrests for reporting report horrific conditions, disease risk at Lackland AFB shelter. Serious uptick in terrorists coming across the border. Lawlessness on the border and in the White House. YOU are the anarchists, not us! Bill introduced to suspend aid to Central America, Mexico until illegal immigration flood stops. HHS unit: services meant to assist border kids "in becoming integrated members of our global society." 1982 Supreme Court case gives illegal border kids right to attend public schools for free. DOD being instructed to house thousands of undocumented kids on base for 15-30 days then release them into U.S.
Say what? 40 MIL U.S. tax $ to be spent on at risk teens in central america. What about at risk American kids? Feds creating permanent new Ellis Island in Texas desert to process thousands of illegals. Are they here to stay? Welcome mat is out? Gov. Perry calls for CDC inspections. Border Patrol processing station: "We don't screen for diseases." Where is the CDC? OK with importing communicable diseases? 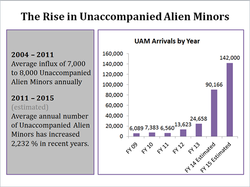 Smoking Gun: DHS sought bids for vendor to handle 65,000 unaccompanied minors – MONTHS AGO! "tuberculosis (TB), Chagas disease, dengue fever, hepatitis, malaria and measles"
Pregnant moms and school-age kids at risk for these diseases as migrants are dispersed throughout the country. Not in my backyard! Virginia townfolk tell feds to send illegal border kids to D.C.